Washington D.C. – An international competition being held on the National Mall from November 15 – 19 to make far cleaner and more efficient wood stoves is focusing attention on the Congressional districts where wood heating is most pervasive. The organizers are calling on the members who represent those districts to develop policy that advances this renewable energy sector. Many of the members of Congress who represent top wood and pellet heating districts are attending the Wood Stove Decathlon to show their support for making America’s number one residential renewable energy cleaner. Among those who have confirmed attendance include Chris Van Hollen (D-MD), Paul Tonko (D-NY), Jared Huffamn (D-CA), Dr. Dan Benishek (R-MI) and Ann Kirkpatrick (D-NM). The Decathlon is showcasing next generation wood stoves that are automated, connect to smart phones and emit virtually no smoke. 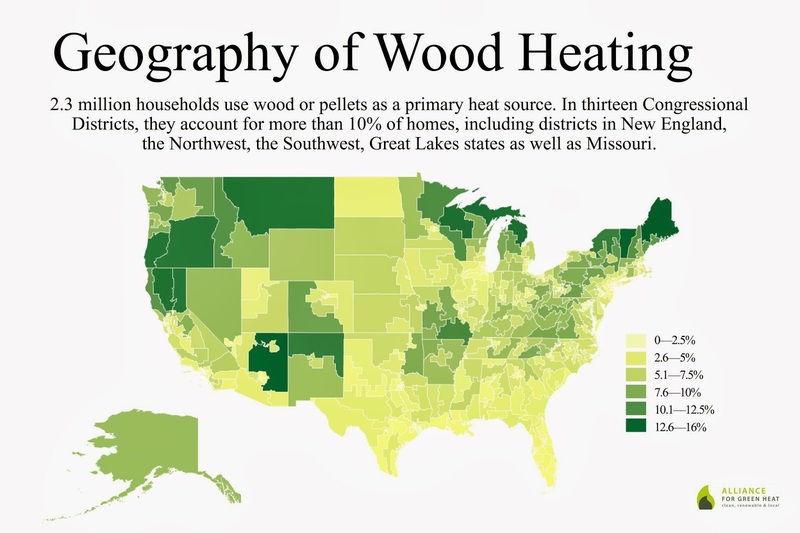 In the 20 Congressional Districts where wood and pellet heating are most common, between 9 and 15% of households use wood or pellets and little or no fossil fuels for heating. For this reason, wood and pellet heating have massive potential to contribute to significant carbon reductions. In some counties in these districts, more than half the homes use wood or pellets for primary or secondary heating. However, many homes still have old, uncertified wood stoves that produce too much wood smoke pollution and lead to the impression that wood heating is just an antiquated, crude form of heating. New technologies like the ones on display at the wood stove decathlon would change this trend. “Wood and pellet heating has already taken off in Europe, but its potential is just beginning to attract attention from the Obama Administration or the US Congress,” said John Ackerly, President of the Alliance for Green Heat, the group that is hosting the Wood Stove Decathlon. “America’s huge fleet of stoves is outmoded and no federal policies encourage companies to make the cleanest stoves, or consumers to buy them. The Department of Energy doesn’t have a single person or program that addresses America’s most common residential renewable energy technology,” Ackerly said. The Alliance for Green Heat is calling on members of Congress who represent the districts where wood heat is pervasive to take a leading role in developing strategies for this technology. Several Obama administration officials and members of Congress will be attending and addressing the large group of companies, engineers, inventors, college teams and renewable energy advocates at the Wood Stove Decathlon. Nationally, 2.3 million households use wood or pellets as primary fuel and make three times as much energy as all residential solar panels. Since 2000, wood and pellet heating has grown 35%, faster than any other heating fuel. “The rapid rise of wood heating since 2000 is great news for displacing significant quantities of oil and propane heating,” said John Ackerly. “And now there is a solution that can drastically reduce the smoke that wood stoves too often emit. It’s the same computer chips, sensors and innovation that is making all major appliances more efficient,” said Ackerly. Policies to bring wood and pellet stoves into mainstream of renewable energy policy and incentivize far cleaner and more efficient appliances include inclusion in the Energy Star program, inclusion in energy audit standards and incentives for the very cleanest and most efficient models. The BTU Act (S. 1007, H.R. 2715) would provide incentives for the most efficient stoves. And EPA has drafted long-overdue regulations to require stricter emission standards for residential wood heaters which will be open for public comment this winter. The top 10 wood and pellet heating Congressional districts are represented by: Mike Michaud (D-ME), Ann Kirkpatrick (D-NM), Peter Welch (D-VT), Dan Benishek (R-MI), Steve Daines (R-MT), Jared Huffman (D-CA), Sean Duffy (R-WI), Peter DeFazio (D-OR), Tom McClintock (R-CA) and Greg Walden (R-OR). The Alliance for Green Heat is a non-profit that promotes wood and pellet heating as a low-carbon, sustainable and affordable energy source. The Alliance seeks to make wood heat a cleaner and more efficient renewable energy option, particularly for those who cannot afford fossil fuel heat.